Overflow crowd at the town hall meeting. Photo by Nick Hahn. 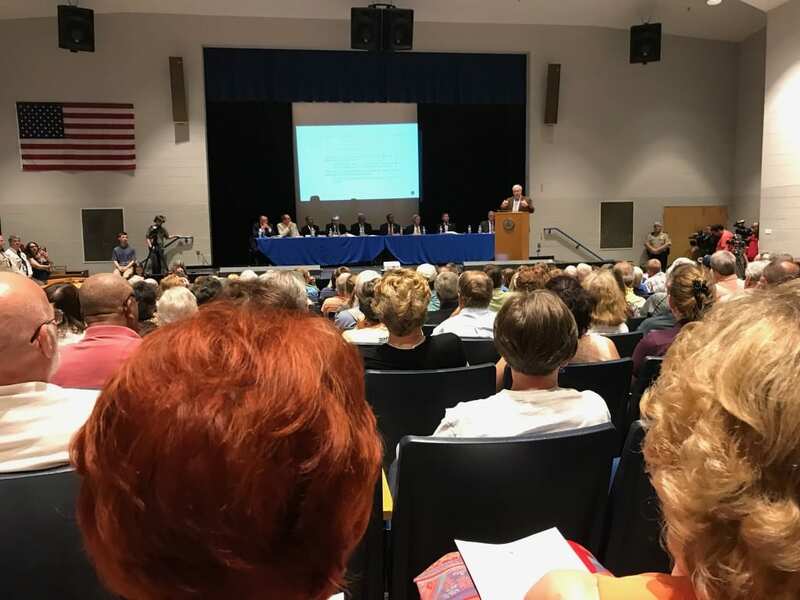 A capacity crowd attended the Thursday, May 24 town hall hosted by the New Kent County Board of Supervisors to learn about the reopening of Colonial Downs and quickly emerging Pamunkey Indian Casino project. Though the locations of the gaming sites are relatively close geographically, their reception by County officials residents is far apart. Those arriving late to the meeting were forced to watch via streaming in a library used to accommodate the overflow of hundred or so that were turned away by the fire marshal after the auditorium met the occupancy count of 400. Many of the attendees were content, even excited, about the potential reopening of Colonial Downs, which offered pari-mutuel racing from 1997 to 2013. The track location is nearly in the geographic center of the County, which is largely rural and is in between Richmond on its west end and Williamsburg on its east end. It’s served by an interchange of Interstate I-64 in a largely rural section of the county. Historically, the track generally directly paid a half-million dollars in taxes to the County, and indirectly through visitation had an even larger financial impact, while causing only a minor impact on services. New Kent County, which has a population of approximately 20,000, modified its county logo several years ago to include the profile of a horse. As an identifying feature of the County, the hosting of racetrack in the locality has enjoyed broad support, once passing a required referendum by an 85-15 margin in the mid-1990s. The five member Board of Supervisors has been focused on reopening the track since its closure in 2014 after running the one-day spring steeplechase meet formerly known as the Strawberry Hill Races. County officials applauded the outreach efforts of the Colonial Downs. 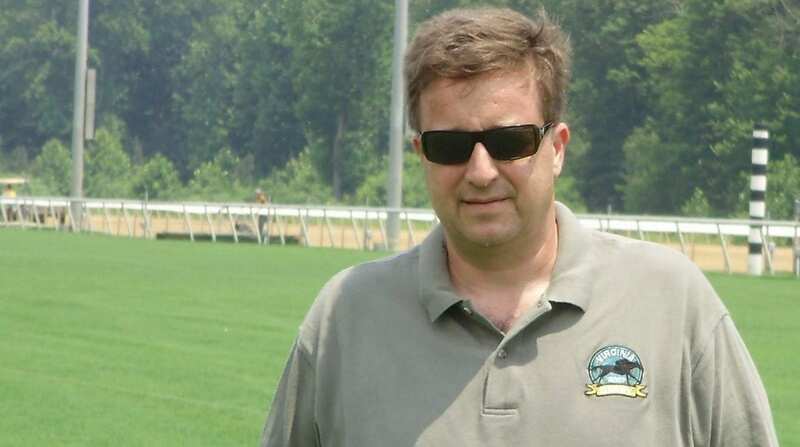 That process involved passing House Bill 1609, sponsored by Delegates Michael Webert (R-18) Christopher Peace (R-97), which allows the Virginia Racing Commission to license historical horse racing at the track and it satellite off-track betting network. The passage of the bill was a condition of the sale to Revolutionary Racing, LLC. now operating Colonial Downs. It appears that the Board of Supervisors went from working with Colonial Downs representatives on day one to one day learning about the Pamunkey Indian Casino project. Afterward representatives of the law firm Foley Quigley PLC, a Minnesota-based firm which specializes in Indian casino development, reviewed the path that could lead to the opening of a casino in New Kent’s west end. The counsel was hired by the New Kent Board to advise and educate the five-member board and its residents of how such an undertaking gains approval. Under the current, complicated process, it is estimated that it would take eight or more years before a casino could be opened. Oddly enough, the local governing body does not have final say on either gambling project. There’s another complication in Pamunkey Indian casino bid. The Trump administration is currently considering revisions to the Indian Gaming Regulatory Act that would make the opening of an off-reservation casino even more difficult. During his brief presentation, Huba expressed his intent to keep the residents informed on the progress and updated on monthly basis. He has experience working at racetracks in Louisiana, specifically Evangeline Downs and Delta Downs, as well as other ventures in the hospitality industry. An informal poll of attendees afterwards seemed to back up the in-meeting reaction that supported the reopening of Colonial Downs, yet a bitter aversion to the Pamunkey Indian casino by county residents. Neither the approach of the different entities to the County, nor their reception by the County, could be much more different. Excellent article and update. Also glad to hear that it would take at least 8 years under current law to open a Pamumkey Casino located in Kent Co. The return of live horse racing at Colonial Downs, continued growth of the VA off-track & ADW networks, and Historial Racing Machines hopefully will generate the needed revenue to revitilize the VA Racing Industry. We don’t need competition from a Pamunkey casino slowing the success of Colonial Downs. I hope the legislature blocks any casino projects not affiliated with Colonial Downs for at least 20 years.